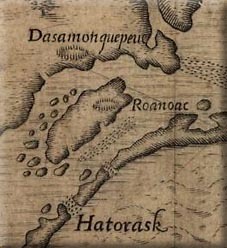 The colony of Roanoke Island was England's first attempt at long term, sustained colonisation in North America proper. It was largely the brainchild of Sir Walter Raleigh who invested large sums of money, time and influence on the project. He managed to convince Queen Elizabeth that a self-sustaining colony in the New World would bring great gains to her treasury and would make a fine base to attack and plunder Spanish ships from. She gave Sir Walter Raleigh permission to claim the land on England's behalf as long as he maintained a colony there. Raleigh would name the area for these exploits 'Virginia' in her honour. There were actually three distinct phases to the unlucky colony - with a fourth phase if you include a reconnoitering expedition in 1584 under the command of Philip Amadas and Arthur Barlowe. These discovered a vast lagoon protected by sandbanks which stretched for 120 miles before opening into Pamlico Sound. They were amazed by the quantity of wildlife, the fertility of the land and the mildness of the weather. They also came across local Indians who they plied with gifts as there was no other way to communicate with them. The Indians seemed civil enough and were curious byt not dangerous at the appearance of these men from over the sea. Raleigh had given strict instructions to not antagonise any local tribesmen that they might come across. At one level, this was to contrast themselves with the Spanish who were notoriously harsh with the local populations of their colonies, but it was also with the idea of building up a colony with consent and help with the locals rather than carving one out by force. Amadas and Barlowe were tactful enough not to offend the local tribal chiefs that they came into contact and even managed to coax two Indian tribesmen to accompany them back to England. On their return, they spoke of an 'Eden' that they stumbled across which would make the perfect location for planting colonists. The land was fertile, the location was protected from storms and Spanish by the sandbanks and the locals were friendly - what more did they want? In 1585, a small fleet set sail under the command of Sir Richard Grenville. Its mission was to travel to the location identified by Amadas and Barlowe, but not without some raiding of Spanish ships and bases on the way. This illustrates the hostility between Catholic Spain and Protestant England at the time, but this hostility would also haunt any fledgling English colony as the Spanish were the superpower of the era and had colonised much of the Caribbean and even had bases on Florida. Grenville's fleet had been dispersed en route to the Caribbean so Grenville waited at Puerto Rico on the Tiger. Whilst at Guayanilla Bay, they constructed a wooden palisade lest any Spaniards arrived to evict them. Sure enough, they discovered the English and were amazed that they had constructed such a large pallisaded fort so quickly. A tense standoff occurred and warning shots discharged but no fighting took place. The Elizabeth rejoined the Tiger and so the colony was now viable again. Grenville was able to capture two Spanish frigates and press them into English service also. There was one more stop at Hispaniola where the Spanish governor was remarkably welcoming and allowed the English to resupply and buy livestock. The English maintained to the Spanish that they were en route to Newfoundland where they intended to start a new colony. The fleet's arrival in Virginia was fraught with difficulty as the much vaunted shoals combined with fearsome winds and currents to pull the Tiger towards the shoals. It grounded and salt water entered the ship spoiling much of the victuals and the precious seeds brought to sow new crops. For a while it seemed as if the ship would be lost, but a rising tide allowed it to break free and at least allow the for an opportunity to repair the damaged ship. The problem was that the ship was still 60 miles south of the intended target, Roanoke Island. Grenville led a smaller party to explore Pamlico Sound and test the waters towards Roanoke Island whilst waiting for the Tiger to be repaired. Within a week he had explored some 200 miles of coastline and had come ashore at a village called Secotan where the two civilisations came face to face in a friendly if confused manner. Fortunately, he had taken Manteo the Indian and Thomas Harriot who had tried to master Manteo and Wanchese's tongue to act as an interpreter. Grenville was pleased that the natives seemed friendly but was shocked at how primitive their village and lifestyle appeared to be. It did not look as if the resources of the land were so abundant as to make them materially wealthy. One thing that Raleigh had insisted upon was the fair treatment of the native Indians and he had instituted an elaborate systems of punishments for anyone who should break his directions. The person responsible for putting Raleigh's will into operation was the experienced soldier Ralph Lane. Grenville moved his large ships back out into deep waters and began the job of ferrying goods and equipment for the brand new settlement. Nothwithstanding the losses from the Tiger, everything that was to support them for perhaps a year or longer would have to come ashore. It was clear that the food supplies were not going to suffice by themselves. Either new sources of food would have to be located or they would have to rely on the goodwill and forbearance of the local Indian tribes to supplement the diets of 107 men. Being a military man, the first thing Lane ordered to be done was the creation of a fort. Although the Indian tribes appeared friendly, there was no guaranteeing that this would remain the case forever. Also, they were worried about being discovered by the Spanish and were under no illusions that they would be exterminated or subject to the inquisition if discovered by them. The problem facing Lane was that there was no stone of rock of any consequence on the island of Roanoke, so a deep ditch and a bank of sand had to suffice supported by timber. It was basic, but Lane's military mind stayed focussed to the task. After the fort was complete, attention was turned to their housing. Rough wooden shacks were cobbled together and communal buildings such as church, storehouse, armoury and stables were put together with the tools and materials to hand. They even constructed a jail with leg-irons, which indicated that Lane was anticipating having to lay down the law at some point or other. Once the basic community appeared to be up and running, Grenville departed on his ship the Tiger. Three weeks after that, the remaining ship Roebuck weighed anchor and headed off into the Atlantic. The fledgeling colony was left to the mercies of the wild and the pleasure of their neighbours, the Indians. Arguments soon broke out as the supposed 'promised land' was not as bountiful with food or raw materials as Raleigh had indicated that it would. Lane imposed a harsh disciplinary system on any shirkers or troublemakers - at least one colonist appears to have been hanged. He then arranged for expeditions to survey the local land and try to find the gold and silver which would make their fortunes and justify the colony's existence. A few weeks later, the local Indian Chief Wingina visited the colony for the first time. The colonists seemed underwhelmed by his appearance which was skinny and lacking the strength and form of many of his warriors. Wingina himself was wary of the newcomers and must have wondered if they possessed supernatural powers or whether they could be trusted or not. His concerns seemed to be confirmed when within a few weeks of the meeting many of his tribespeople began dying of some strange malady or disease that they had never come across before. Unbeknownst to the Indians, they were suffering from smallpox and measles brought over by the colonists and they had developed no natural immunity to these diseases. The guns of the colonists also fascinated the Indians who could not comprehend at first how the weapons worked, but were keen to find out. They were equally interested in the forms of worship that the colonists were practicing. They marvelled at the existence of a book that seemed to communicate directly the word of the colonists' god. The Indians were wary of the colonists and their attitudes and tolerance of the colony would change markedly over the coming months. In the meantime, the summer months had given way to autumn and the colonists got the first hints that their housing and clothing would not be adequate to the temperatures and weather on its way. They were also worried about the lack of provisions due to the grounding of their ship on arrival. They had been unable to plant crops in time and no food was forthcoming in what should have been the harvest season. They found it difficult to catch the fish near to the island. They were unable to master the Indian fishing with traps methods and were not skilled enough with bows to spear the fish by arrow. Even hunting by guns was problematic as the gunpowder had become damp in the Tiger disaster and not recovered its full potency. The difficulties in hoarding food did not seem too overwhelming as the Indians were bringing in their own harvest and appeared more than content to trade and share their produce - for the time being. However, the Indian society did not produce a massive surplus in food and they had to pace their supplies for thier own survival. Lane organised expeditions overland and by boat to reconnoitre the local environment. One of these expeditions was particularly interested to find the deep water bay of the Chesapeake about 40 miles to the North and made a mental note of its suitability for ships in the future. Over the winter months, relations between the colonists and the Indians had deteriorated markedly as they grew more reluctant to trade their food with the Europeans. Some of the colonists had taken it upon themselves to seize some of the stocks of food from the Indians and take them by force. Wingina's patience had snapped and he set up recruiting a huge army from his tribute nations. Lane took the initiative though and sailed to the mainland on hearing that a large army was being assembled there. Boldly he marched a phalanx of 40 armoured soldiers into a local village and seized the chieftan there. This chief confirmed that they had been told to raise an army with a view to wiping out the Europeans once and for all. He also learned that tribes to the West had copper in abundance. Lane organised a hasty expedition which he led to discover this valuable commodity. They travelled some 160 miles upstream before lack of food and hostile tribes forced them to turn around disappointed. They returned to Roanoke just in time as Wingina had told the remains of the colony that his men had killed Lane and his expedition and that they were now leaderless. Lane's reappearance undermined Wingina's authority markedly and pro-European elements in his tribe pressured him to relent in his hostility to the colony. The change in heart was confirmed when the mainland tribe that Lane had so boldly attacked declared allegiance to Lane's Great Chief 'Elizabeth'. As spring arrived, it appeared that the colony had survived its harshest test and could now look forward to more bountiful seasons. Unfortunately, events wouldn't turn out as easily as Lane had hoped for. On April 20th, 1586 the leading pro-English Indian in Wingina's tribe, Ensenor, died. There was a shift in attitude back to hostility towards the existence of the colony. Wingina ordered his tribe not to help the Europeans any longer and to refuse to trade with them. Lane was forced to divide his groups up into foraging and hunting parties and divide his colony up. Emboldened by the precarious state of the English, Wingina resolved to rid himself of the colony once and for all. Lane learned of the plan from a sympathetic Indian and resolved to make a pre-emptive strike on Wingina's settlement on the mainland. He put out a false rumour that the English fleet had been sighted on the distant horizon to buy himself some time. He knew that this would cause Wingina to hesitate and allowed him and his colonists to gather up the canoes from Indians on the island to allow him to ferry across to the mainland and assault Wingina's camp directly. Two Indians seemed to escape and head off towards the mainland. They were caught by Lane's men and decapitated. Some of the Indians on the island saw this horrific events unfold and started to attack Lane's settlement but were unable to send a message across to Wingina. Lane resolved to continue his assault on Wingina and set off with his small flotilla of canoes. He sent a message that he was on his way to Croatoan island but wanted to have a word with Wingina. The chief suspected nothing and gave permission for them to enter his compound. On entering, Lane ordered a broadside at the seated collection of the Chief and his advisers. Wingina was wounded but was able to escape into the forests only to be followed at breakneck speed by two of the colonists who brought back his head shortly. The immediate threat to the colony had been removed, but great distrust and hostility and been generated as a result. Barely a week later, all of the problems of the colony appeared to be over when a huge fleet was indeed spotted on the horizon. It heralded the arrival of Sir Francis Drake who was searching for them after having attacked the Spanish in the Caribbean. He had even attacked the Spanish forts in Florida which he believed, correctly as it turned out, would be used as bases to seek out and destroy the fledgeling English colony of Roanoke. Drake's fleet had to stay out at sea due to the dangerous shoals, but had volunteered the services of a 70 ton vessel the Francis and various smaller boats to Lane and his men in addition to essential supplies and ammunition. It seemed that the colony would survive after all. They duly set about loading up with stores and victuals and began the process of ferrying them over the shoals towards the island. Yet again though, the wheel of fortune was to deliver another blow to Roanoke. A massive storm hit the waiting fleet, scattering many of the ships in a three-day long meteorological assault. Disaster made itself apparent when the Francis with many of Lane's men on board and most of the supplies failed to reappear and return to the fleet in the aftermath of the storm. Drake offered a smaller bark, but the loss of manpower and stores was devastating. A reluctant Lane declared that the only sensible option was for the colonists to return with Drake back to England. 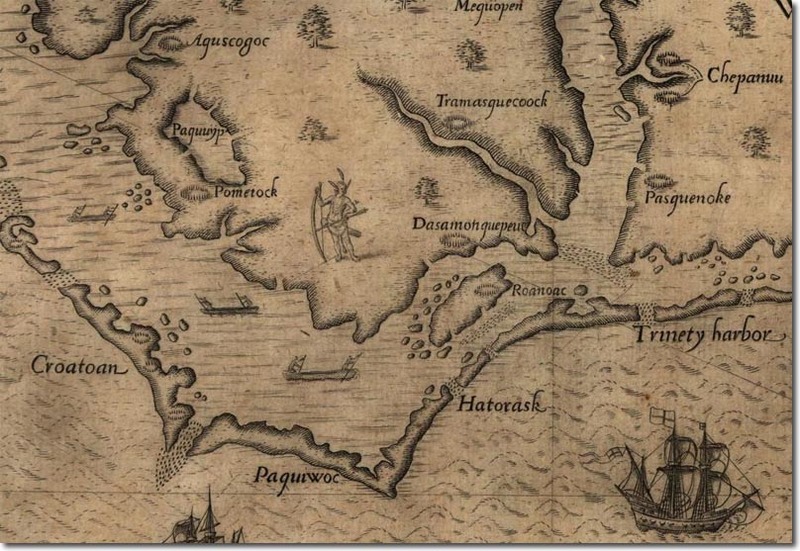 The first Roanoke Colony had come to an end. It had achieved much but had been bedevilled by setbacks and difficulties from the very day of their arrival. Lane had managed to allow it to survive due to his single-minded determination and military prowess. His professionalism and leadership had allowed the colony to survive in a hostile landscape for a year. However, the legacy of his time was the enmity of the local tribes who did not know what to make of the intentions of the ruthless colonists, but knew that they could not be trusted. Just days after the departure of Lane and his colonists, the colony's first supply fleet arrived off the Outer Banks. Sir Richard Grenville had been tasked with bringing the actual supplies for Lane's colony. Drake had merely dropped in on the colony after completing his own expedition. Grenville was surprised to find the settlement deserted, an Englishmen hanging from a tree and dead Indians. The Englishmen was probably a mutinous crew member who had been made an example of. Grenville spent two weeks sending teams to search for the colonists and to try to figure out what had happened. He captured a group of Indians who could speak enough English to tell him of their departure on a fleet of ships. Grenville was unsure of what to do, he did not know the intricacies of the politics that had led to warfare and the withdrawal of Lane. Grenville resolved to leave a small party of 15 men under the command of Master Coffin to repossess the fort whilst he returned to England for further instructions. Master Coffin set about reorganising the fort and defences on a smaller scale for the much reduced garrison he had available. Unlike the previous colony, they had been landed with plenty of victuals and supplies. They did not need to trade and interact with the Indians and tried to isolate themselves on the island and keep to themselves whilst waiting for Raleigh to organise replacement colonists. Raleigh was indeed planning a new expedition and one that would be very different in character from the original Roanoke one of soldiers and prospectors. He put together a more mixed group of colonists that also included women for the first time. It was to be under the control of John White, the artist from Lane's colony. But it would take months for them to return to Master Coffin's holding colony and when they did arrive, they were horrified to find the bodies of some of the reluctant colonists. They had been killed by Indians. It was clear that Lane's actions had stirred up feeling towards the latest arrival of Englishmen. White learned that Master Coffin had been tricked into leaving the fort by apparently friendly Indians. He was immediately seized and killed on the spot. Indians then charged the fort and fought a hand to hand battle with the Englishmen. After a ferocious battle in which a number of the Englishmen died, the survivors put to see in a pinnace and searched for sanctuary. John White's colony got off to a nervous start having found the remains of their countrymen. Further discord occurred due to the hostility of the commander of the fleet, Fernandez, with the colony's new governor, White. Fernandez was more interested in plundering the Spanish possessions and ships than in babysitting the colonists as they got their feet on the ground. White had originally agreed with Raleigh that he would set up a new colony in the Chesapeake with its deeper bays. Fernandez was impatient to get off South to the Caribbean before the Spanish treasure fleets disappeared and told White to unload back onto Roanoke and head north overland or in stages with a pinnace. Morale was very low but the colonists got to work repairing the houses and buildings of the colony yet again! They were happy to see one of the ships that had been separated from the fleet arrive on the 25th July bringing the remainder of the colonists and some more supplies. But before they could feel too confident, one of the colonists was attacked and killed whilst hunting for crabs in the bay. White showed that he did not have the military mind of Lane and failed to react immediately. Instead, he called on his Anglicised Indian, Manteo, to ask for a parlay with his tribe on Croatoan Island where it was hoped that an agreement to coexist could be made. They had explained that it was Wingina's old tribe that had killed Master Coffin's men and were intent on returning to oust the new colonists. White decided to make an attack across onto the mainland but when he launched an assault onto a village, he found that instead of killing hostile tribesmen, he'd accidentally killed Croatoan tribesmen who had anticipated the attack and had crossed to the rival tribe's village only to find it abandoned. They had entered the village and were rummaging through the goods there when White turned up and attacked them assuming them to be hostile. White had now made the situation for his nascent colony many times more precarious. He had now alienated the one tribe that had been willing to tolerate and aid his colony. 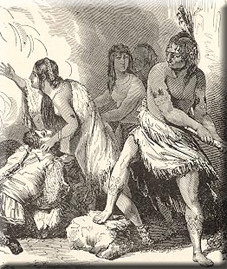 White desperately tried to make amends and saw to the wounded and ordered his men to help the Croatoans gather the food from the attacked village. The English kept a low profile for a few days but then performed an extraordinary ceremony at the request of Sir Walter Raleigh before they left England. Their Indian translator was baptised as a Christian and then given the title Lord Manteo of Roanoke and Dasemunkepeuc. He was 'technically' given powers over the local Indians in the area claimed by Elizabeth, although the Indians themselves were unaware of their new subject status. The English colonists remained under the command of White himself. He was the first of the so-called 'savages' to become in English eyes at least 'civilised'. There was further good news a couple days later with the birth of the first child to English parents on American soil, Virginia Dare. She was the grandchild of John White and the daughter of Eleanor Dare. The Virginia was in honour of the new territory and the queen herself. Whilst all these events had been happening, Fernandez and his ships still lay at anchor. This seemed strange as he had told White that he could not sail up to Chesapeake for fear of losing valuable time. A storm had forced them out to see for six days but then they reappeared again before sending a message to White they did intend to leave for good. The settlers were concerned that the supply ships promised by Raleigh would sail to the Chesapeake and miss them at Roanoke. They wanted to ensure that Raleigh understood the change of plan. It was agreed that they would send back a messenger but couldn't agree who it would be. After much argument and persuasion, it was decided that White himself would be that messenger. It seems strange that the governor himself was the one to return but perhaps the colonists had lost some confidence in his leadership abilities and were happy to see him go. They agreed that they might still go northwards to Chesapeake but if they did change location they agreed that they would carve the name of their destination on a tree. Further, if they were leaving due to being distressed in any manner, they were to add a Maltese Cross above the letters. White's journey back to England was beset by difficulties and hardship before limping back to Ireland, dazed and ridden by scurvey and malnutrition. he barely had enough crew to get him to England and had to take another ship to Southampton and explain to Raleigh the strange start to this latest colonial venture. White's journey could not have been timed worse. He arrived just as fears of an Armada were at their height. Elizabeth refused to allow any ships to leave English territorial waters so that they might be used to fight against any Spanish invasion force. This meant that all Raleigh's plans of supply fleets were doomed to failure. At least until the threat from Spain had been met. The Spanish threat was also a threat for the missing colony. The Spanish sent a mission towards the Chesapeake as they had heard of Raleigh's attempts at creating a colony and worried that it would be used as a base to attack their ships and possessions in the Caribbean. They searched the Chesapeake to no avail, but whilst returning southwards, they spotted a slipway for a boat on the outer banks. When they came ashore on the sandbanks they found English barrels and debris. They did not think to cross to Roanoke island itself and assumed that they had merely found a loading point. They were only two miles from where the colony was supposed to be located. It was not until 1590 that any such fleet could be got together, an alarming two and a half years since his departure. He was aware that his daughter and his granddaughter were still in Virginia and had had to fend for themselves for an unanticipated long period of time. Two ships were all that Raleigh could get together as they set sail in March. After some naval skirmishes and some foul weather, they made it off the coast of Virginia by August and were pleased to see smoke rising in the distance and assumed that this was the colonists signalling to them. A landing party was arranged and headed towards the smoke signal only to find that it was too far inland. They then waited overnight before heading to Roanoke proper. But disaster unfolded as one of the boats was overturned in the rough surf and seven were drowned. By the time they got to the settlement they were struck by an eerie silence. There were Indian footprints all over the place, but not a sign of an English boot or shoe. They searched the area and found a tree with the three letters 'CRO' carved on it. It looked as if it had been hurriedly carved and had not been completed. But there was no Maltese Cross to indicate distress. Further exploration found another tree with the word 'CROATOAN' carved on it, without any sign of distress. It seemed clear that they had moved to Croatoan island, but there was no reason as to why. White's best guess was that they had gone to Lord Manteo's tribal grounds for some reason or other. Although the island was even smaller than Roanoke and would surely be unable to support such a large influx of colonists upon the Indians. He was further puzzled when they discovered that many useful items had been left at Roanoke, like lead and iron and some cannons. He even found that his own possessions had been dug up and had been scattered about. It was clear that the site had not been inhabited for quite some time by the overgrown nature of the place. White and the crew returned to the ship only for poor weather to drag the ships towards the sandbars. As the weather grew grimmer still, the Captain of the fleet demanded that they return South to the Caribbean and resupply before coming back to Croatoan. He had lost all but one of his anchors and thought the whole coastline too treacherous to remain there in the current weather conditions. Once again, ill luck would plague White as a violent wind carried the ship he was in thousands of miles back to the Azores. It was clear that they would have to return to England itself. A disconsolate White returned to Plymouth and wondered if he'd ever see his family again. Despite the baffling disappearance of the colony, there was no expedition sent back over the Atlantic for some time. This was due to a number of factors, most importantly Raleigh's fall from grace after marrying without the Queen's permission. He was arrested for some time and was then banished from court. Eventually he hoped that a grand gesture such as the discovery of 'El Dorado' would win him back the trust of his Queen. He had intended to call in on the Roanoke colony but events conspired against him as his expedition went from one disaster to another. It did actually suit Raleigh to not know what happened to his colonists. If they had all been discovered wiped out then it would mean that he would lose his right to the lands of Virginia. If they were merely 'missing' he could claim that he was fulfilling the Queen's demands to have an active colony in place at least as far as he knew. Another attempt to discover their fate was launched in 1602 but it did not even make it past the Outer Banks before bad weather disrupted their plans. The mystery of what happened to the colony has never been 100% explained but Captain Smith who accompanied a rival Virginia Colonial venture in 1607 heard what 'may' have happened to the hapless colonists. The Jamestown colony was set up in the Chesapeake as White's colonists had originally intended. It had similar problems of dealing with natives, but magnified to an even greater danger due to the size and power of a local confederation of tribes under a powerful ruler. Smith claimed that the local ruler had ordered the destruction of a European colony on the Chesapeake (which had been their plan) on seeing the arrival of a fleet of ships (bringing the Jamestown colonists). He was concerned that they would join together with these new settlers and provide them with detailed information on the area. Chief Powhatan showed Smith remains of musket barrels, iron and a bronze mortar as evidence for the settlement. If true, this meant that the colony had moved northwards as planned and functioned for two decades without any help from England whatsover. Many are sceptical about these claims and no archaeological evidence has ever been found to suggest a European colony on the Chesapeake. Rival theories centre around absorption into local tribes, perhaps by force, perhaps voluntarily as the settlers realised that they would need the support and skills of the Indians if they were to live in such a hostile environment for so long. Of course, they could well have been murdered or attacked in the manner that the colonies of both Lane and Master Coffin had been. Perhaps they took to the seas in their tiny pinnace and attempted to sail to the Caribbean or England but were defeated by the elements. The fact is, nobody knows for sure, but the cryptic message suggests that they did not leave under duress. But what happened to them after leaving Roanoke, nobody knows for sure.